Can it be that I have not blogged in over a month? For shame!!!! I suppose work has been busy (actually work seems to keep busy 24/7!) Then I have home and Mommy duties to take care of and a couple of volunteer organizations I belong to...so I think blogging lost out to everything else. But I have missed it. The last couple of weeks so many times I planned to blog but then I didn't for what ever reason. I am getting more organized and adjusted to my life and what being a single Mom and working full time means lately. I am getting my house organized a little at a time, even though that feels like an uphill battle. I am starting to force myself into areas that I used to love and I have gotten away from in the last couple of years like cooking and gardening. If I can find time to read for pleasure I will feel pretty accomplished! One thing I don't think I have mentioned is 2016 makes me a Mother of the Bride! Yes, my beautiful daughter is getting married in April. She is so excited and wedding invitations have gone out and plans finalized. It is a strange season for me personally...my baby girl is getting married. How can that be real? 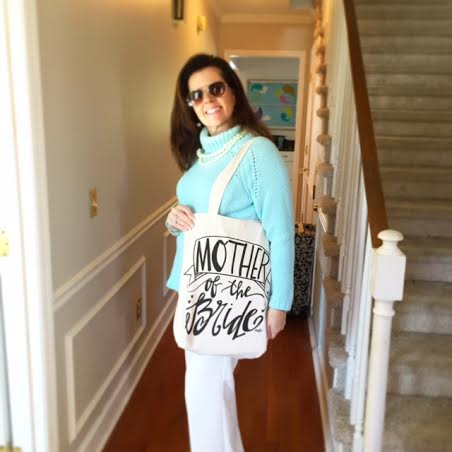 My daughter actually gave me the super cute tote bag in the picture for Christmas so I carry it every chance I get because lets be real, how often do I get to be a Mother of the Bride....just once! So, here's to blogging again and learning write and sharing my life!